Wedding’s is one of the most celebrated occasion in our life. It brings so much joy and happiness. And here are some tips from Kate Smallwood on how you can save money on your wedding day when it comes to food. With a large proportion of the wedding budget spent on food and drink, the obvious way to cut costs is to reduce your guest list. While it may sound harsh, menus are generally priced per head, so it goes without saying that you can wine and dine 50 guests far less expensively than you can 150. Keep your wedding an intimate occasion, and splash out on a post-honeymoon drinks party. Sad but true: the most popular times of the year to tie the knot are also the most expensive. Many ctaering suppliers charge more in peak season, and at other times of the year when demand is high such as public holidays. Choosing to marry on any day other than a Saturday, and avoiding the height of summer, can be beneficial to the bulging budget. We’ve all been to weddings where we happily scoff delicious canapés before sitting down to a wedding breakfast with numerous courses. Within no time we find ourselves indulging in coffee and wedding cake, with just a few twirls around the dance floor before an evening buffet appears. Quite simply, it’s too much food, and food costs money. While you don’t want your guests to be hungry, you don’t need to overfeed them either. Simple touches can save the pennies – stick to canapés instead of a starter, or serve your wedding cake for pudding with ice cream and hot toffee sauce. The longer you celebrate, the more you’ll splash out on food and drink. Couples who marry at lunchtime are likely to serve their wedding breakfast in the early afternoon, and need to feed their wilting guests again in the evening. Saying ‘I do’ a little later in the day can mean you dine early evening, needing only to offer guests a bit of ‘blotting paper’ towards the end of the night – cheeseboards and cake being the perfect choice. Cut costs by offering a simple menu for younger guests. Ask any child at your wedding whether they would like the adult five-course extravaganza, or lasagne followed by ice cream… and the pasta will win hands down. It’s better to serve a beautifully prepared, simple menu, than to use elaborate methods and expensive ingredients that won’t appeal to all your guests. Choose talented chefs and seasonal produce. Tasty, well-cooked food will always be popular and doesn’t have to cost the earth. When it comes to drinks, ask your venue if you can bring your own, taking advantage of the excellent supermarket offers on alcohol. Some venues, particularly hotels, will say no, or charge such high corkage it’s not worth it. However, other venues without in-house caterers will often agree. Shop around for the best deals, including Christmas discounts if time allows, and see whether you can purchase on a sale or return basis – always better to have some left over than to run out. Formal silver service requires waiting staff, and the fewer staff you need at your wedding, the less you’ll spend. Buffets are a good option as guests can help themselves – consider barbecues, street food stalls or afternoon-tea parties as a more contemporary adaptation. Alternatively, introduce a ‘carve at table’ option where each table allocates as guest as ‘head chef’ to serve their joint of meat. It’s fun, a real talking point and it will save your pennies. Now ,we’re not suggesting that the wine shouldn’t flow on your big day, but it is a good idea to be clever about exactly what flows. Stick to prosecco or cava as an alternative to Champagne, and provide wine, beer and soft drinks if you’re funding the bar. It’s perfectly acceptable to expect guests to pay for spirits if that’s their preference. Cocktails are a great idea, enabling you to offer something fun within a set price bracket. As a rule, long is good, strong is not! Whatever you decide, make sure the food at your wedding is presented beautifully, and the service is impeccable. It should be noticed, appreciated, imaginative and a vital part of the day. Create food stalls that also double-up as entertainment and give home made cookies as favours that your guests can also enjoy with their coffee. You want your guests to remember the food at your wedding for all the right reasons. Planning a wedding is not an easy task to do. It is also not the most affordable one. 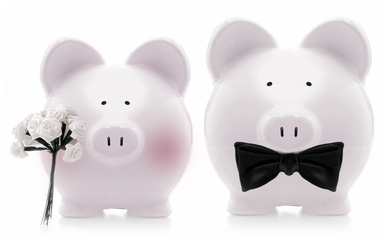 So here are some tips from Style & The Bride on how you can plan your wedding on a budget. Tell your florist which month you are getting married in and ask him/her to tell you the flowers that will be available seasonally without having to source blooms from overseas. Locally sourced flowers are better value as otherwise you will have to pay import costs. If you like the idea of favors, but don’t want to spend a small fortune, why not get favours that double up as place names? Ideas include personalized cookies, miniature photo frames with names inside, or shot glasses filled with sweets with the guests’ names engraved on them. The Great British Bake Off has spawned a new generation of avid bakers. Where once only your great aunty would be able to whip up at a victoria sponge at a minute’s notice, now even your most fashionable of friends are getting in on the act. Why not ask each of your ‘baker’ friends to contribute a cake for your dessert table? 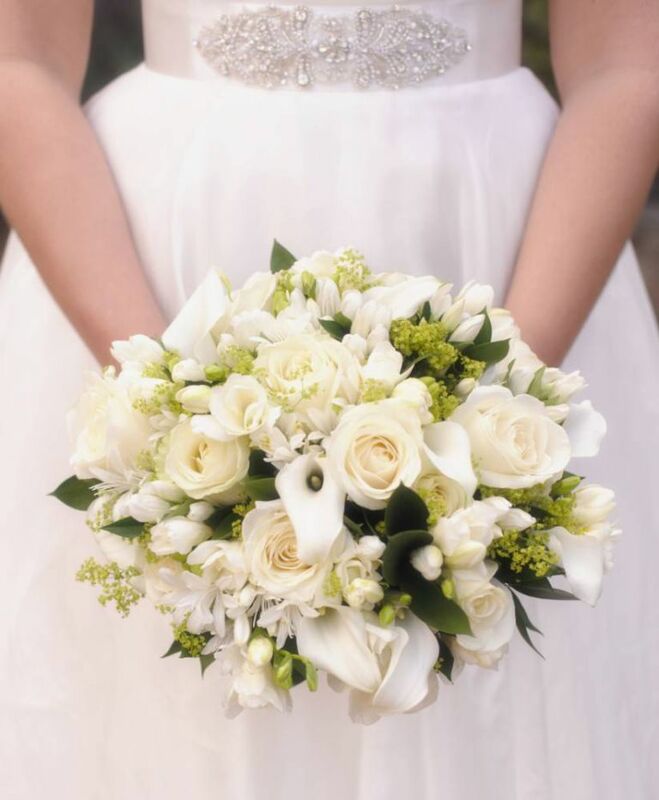 After the wedding ceremony, what happens to your bridal bouquet and the bouquets of your bridesmaids? Often they go to waste. So get your mum or bridesmaids to take them from you after the ceremony and use them as table decorations at your reception. If you can’t afford expensive flower table centers, why not do something that won’t cost much but will still look stylish and personal? Get photographs of you and your groom throughout your relationship and place them in photo frames. Dispense with favors and write handwritten notes to your guests that won’t cost you a penny. If you write a little note to each guest on why you are so happy that they are at your wedding, not only will they be deeply touched, but also it will avoid you having to splash out. Buying new jewellery for your wedding can be incredibly expensive. Instead of choosing just one item for your ‘something old,’ ask aunties/grandmas and mother-in-law to bes if you could borrow earrings/bracelets/necklaces. You can still have a designer wedding dress if you are planning a wedding on a budget. Many bridal designers have sample sales at the end of the season where you can find gowns at a fraction of their original price. 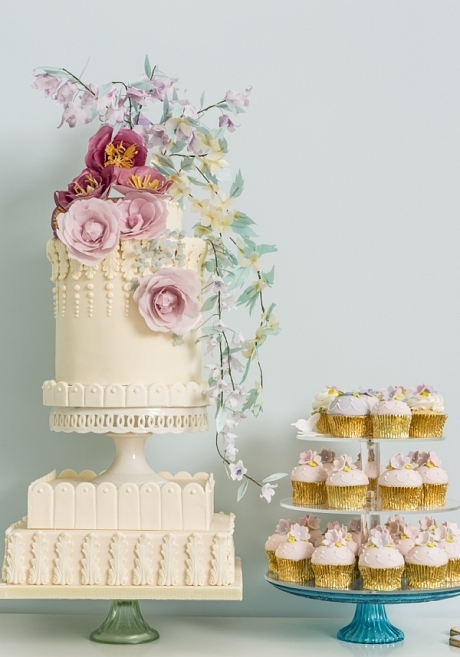 Not only will you save money by not having a stand alone dessert, but the saving will allow you to splurge a little bit more on the style, flavours and fillings of your wedding cake. Professional wedding make up artists can be very expensive. However, if you pay a visit to a big name beauty counter at a department store, they can do your make up for free and give you tips and advice that you can use when doing your own bridal make up. The most popular weddings are at the weekend, so if you opt for a wedding in the week, they are about a third cheaper. Rather than hiring transport to the ceremony and reception, ask your friends and family if they have a luxury car you could borrow. If you know another couple who are having a wedding ceremony before or after yours, why not ask them if you could share the cost of wedding flowers? You can opt for classic flowers that will suit you both, and then you can split the cost between you. If you are having a winter wedding, and have a great big stash of decorations that you only get out at Christmas, why not use them to decorate your reception? Your friends are one talented bunch, so make sure you make the most of them. If you have one who is a hairdresser, I am sure they would be happy to do your hair for free. Or, alternatively, perhaps you know someone who is great with flowers and could help create your bouquet and bridal arrangements at a reduced cost? Ask your girlfriends over one evening for a ‘wedding craft’ evening, making decorations and favors. Not only will it be incredibly beneficial in terms of cost, but also it is a great excuse for a gossip. As wedding cost continue to rise, not just in UK, but all over the world, wedding couples are having a hard time for their wedding. More and more wedding couples are either delaying their wedding or opting for a very small celebration. Laura Strutt of DIY Wedding Manual gave some tips though on how to slash the wedding cost and save more for your wedding. If you have your heart set on a designer dress, but can’t afford the big price tag, call around your local wedding boutiques and find out if they host any end of season sales or when they sell off their sample gowns. Now is probably the only time you can really ask those cheeky favours from friends and family. Is your aunt a talented dressmaker? Can your sister bake wonderful cakes? Are your best chums brilliant musicians? Why not find out if anyone can offer their creative services to help. What’s more, having a wedding cake lovingly baked by your siblings is far more memorable a gift than receiving another toaster. There are so many places where you can shop for your wedding supplies — wedding boutiques, dedicated online stores, the high street, craft shops, vintage stores and markets. Take some time out to shop around to ensure that you get the best prices. Handy tip — do you have a stash of unused gift cards? Why not see if you can use these for your wedding fund. 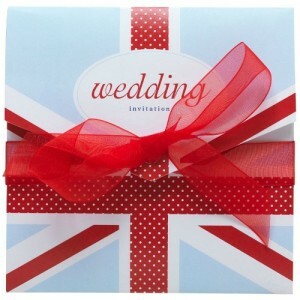 You might be able to cover stationery costs, or even kit out the bridesmaids in pretty accessories. Wedding planning can be stressful — especially when you have your usual daily tasks to keep on top of too. Getting flustered can result in making rash decisions and can often result in costly mistakes. Double check your calculations before buying supplies, confirm elements with suppliers until you are completely happy and maybe take yourself for a coffee and count to ten before spending a big chunk of your budget on an impulse purchase. Wedding costs are certainly going higher and higher by the year. A recent quote of £18,244 has been seen as the average price of a wedding. 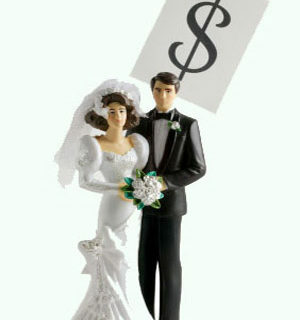 Due to this more and more couples are seeing themselves indebted as a result of getting married. And we here would like to help by listing Bridal sales we come across. And as a starter, The Hospitium in Museum Gardens is set to host this January. This wedding table top sale set by York Venues is set to help couples reduce the cost of their big day while married couples can make way of making some money by selling and putting their used wedding items on sale. The wedding car boot sale will be taking place on January 19, 2014, 11am-3pm. Stall holders can book a 6ft table for £15 and browsing is 50p. To book a stall or find out more information contact Jennifer Cork on 01904 687671 or email Jenn.Cork@ymt.org.uk. Of a dream honeymoon abroad. We’d like a bit of sun. That’s not the way it’s meant. The things that we need, we’ve already got. Don’t alter your plans for a pre wedding rest. Then save all the hassle and do this instead…..
Don’t know how to word this but will give it our best shot.. Contributions are most welcome, we’ll go somewhere hot! Honeymoons are a good reason to ask for money instead of a gift. But, often, you might prefer for money to spend on either improving your current home or some cash towards the purchase of your next home together. Many couples are now using a wedding wishing well or post box for guests to place their gifts cards. You can hire a full size wishing well or buy a ready made well or even have one custom made by one of the many personalised stationery businesses. Please give us money for our saving pot. To help us do some home improvements at a later date. We would like the money please! But we’d prefer a donation to our Wishing Well! It’s difficult enough planning a wedding but throw in a budget and you might think that your dreams of a fairytale wedding are about to come crashing down before you. Yet many couples now face that prospect in the current economic climate. However budget weddings needn’t mean sacrifices – with a bit of planning and an eye for a bargain, you can still have the wedding of your dreams at half the cost. Shop for a wedding dress in a specialised wedding bureau and you could see your bank balance go down by as much as £10,000. Even hiring a dress can be a costly business. That’s why many brides-to-be are hunting around for a bargain wedding dress in places such as Oxfam and Ebay. In fact Oxfam found the demand for cheap wedding dresses so high that they now have dedicated Bridal Stores specialising in second-hand wedding dresses from as little as £75 to around £600 for a designer dress. eBay is also a good place to look with many brides selling on their dresses after their own big day has passed. Not all dresses are second-hand either, many outlets have also cottoned onto the popularity of buying wedding dresses from ebay. Don’t think that both Oxfam and Ebay specialise only in bargain wedding dresses either, you can kit out your bridesmaids, ushers, groom and best man too. All for less than half the price you would pay on the high street. If you still want to buy your own gown then many high street stores also offer good value for money. Marks and Spencer, Debenhams and Bhs all do high quality but reasonably priced wedding dresses. 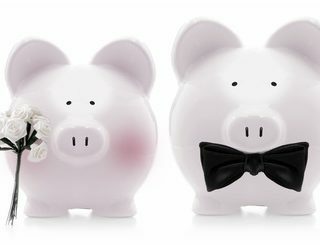 Another budget saving idea is to ask bridesmaids, page boys and the best man to buy their own outfits. Most little boys will have smart suits at home for special occasions that would make a more than adequate page boy outfit and little girls can get some stunning yet cheap outfits from the high street that will double as party wear. When I got married I used my works computer to design a batch of invites which I then printed off and handed out at zero cost to myself. But I now realise that most people have higher standards than I do! However making your own wedding stationery is now becoming quite the trend amongst brides-to-be. Why pay hundreds for some pre-designed wedding stationery when you can make your own, personal and unique invitations? With most couples now setting up home before they get married there is very little they need that they haven’t already got. Thankfully most major stores such as John Lewis provide a wedding list service to ensure that you don’t end up with 5 kettles and endless towel sets. However some couples are ditching the wedding list idea completely and are asking for money donations instead. If you don’t like the idea of asking for money then most travel companies such as Thomas Cook do travel vouchers that you can put towards your honeymoon. 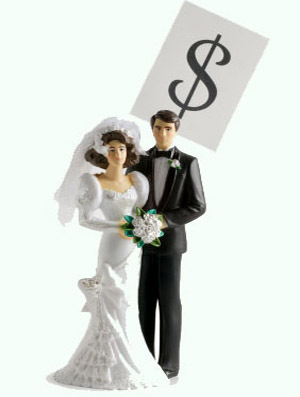 Other couples go even further and use their wedding day as an opportunity to raise money for their own charitable cause. But personally I think there is nothing wrong with asking for cash instead of gifts that you can both spend together on something that will mean so much more than a duvet set. 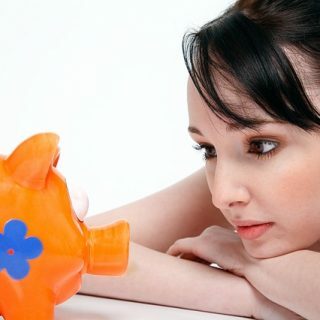 Setting a budget isn’t the most romantic of notions but it will help to keep your spend under control. Take a gander at our downloadable wedding budget planner. Now all you have to do is to stay beautiful and get on with enjoying the best day of your life! You can expect to pay a minimum of £300 for a basic church wedding and once you add on all the extras such as a choir, bell ringers and an organist you will be nearer to four figures. A marriage at your local register office is the least expensive option, though the number of guests you can invite will be limited. A civil ceremony at a local venue can work out a lot cheaper, plus if you have your reception at the same venue you will save a small fortune on transport as well. You might think that employing a wedding consultant or wedding planner may be a luxury you can’t afford. But, often, their inside knowledge and willingness to negotiate may mean that the cost of using them is far outweighed by the potential savings. Some wedding planners will even work for free on the basis that they can make commission from the various suppliers they arrange. While this is not always the ideal solution – it’s worth considering. The reception is by far the biggest cost of any wedding, and also the place where you can save most money. Reckon on at least £15 to £20 a head for a sit down meal, though having a buffet or carvery is one way to keep the cost down. If you would rather have the meal served then remember that silver service can add a lot to the cost – consider having courses served plated instead. It makes no difference to the quality of the meal but costs a lot less to deliver. You can save most money by having your wedding at the end of the Summer when there is less demand. Naturally, you risk worse weather but if you’re having a ceremony and reception at one venue this is less important. Consider having your wedding mid-week as well, (which also means that less guests will be able to attend!). Beware of packages, whilst many of the items/services offered in the packages may sound great, remember very little of it is free. Did you budget for these extras? Do you really want them? If not, say that you don’t want everything that is included and that you would like a new package without all the extras. 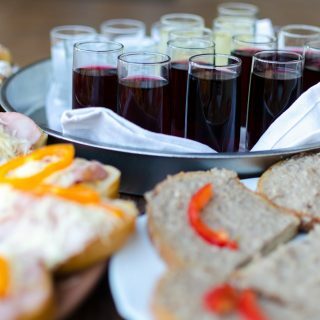 It’s impossible to offer a catering package that suits everyone, so ask for a bespoke package. If they can not adjust their pricing then ask what they can give you in the way of value? Can they offer a discount for people staying over or upgrade accommodation which is already included? Buy your own wine and pay a corkage fee rather than buying from the venue. You can use Cava for the toasts rather than champagne – few people know the difference and it costs a lot less. If you have your ceremony and reception at the same venue then you will spare the expense of moving yourselves and your guests between venues. Alternatively, you can save money by organising lifts for close family members with friends. If you are transporting a lot of people, then unique wedding transport ideas like vintage buses are a good idea and tend to be more cost effective than taxis. Plus, you can be assured that your guests will all arrive on time and at the correct place! In every good fairytale the fairy godmother always manages to conjure up the princess’ dress of her dreams with a little practical application of her magic wand. We may not have a magic wand but we can wave a little practical advice your way and ensure that you still look like a princess for your big day without feeling like a pauper afterwards.